Population 40 million; Majority Human but with significant populations of all sapient species found in the Verge. Žemyna is the Earth-like moon of a Jupiter-sized gas giant planet, Perkūnas, with a flamboyant set of rings. Perkūnas in turn orbits a white sun-like star, Saulė, just a little bit cooler than Sol. Žemyna is tidally locked to Perkūnas, so Perkūnas always hangs in the same place in the sky from any given spot on Žemyna. On the hemisphere facing Perkūnas, the gas giant presents a spectacular sight. During the long nights, the light from the sunlit side of Perkūnas brings illumination to the Žemynan landscape. The strong radiation fields of Perkūnas interacting with the magnetic fields and atmosphere of Žemyna give rise to bright auroras, visible from most places on the planet every night. Perkūnas has many other moons, some similar in size to Žemyna. These other moons are easily visible from Žemyna, and major geographic features and weather paterns can often be made out with the naked eye. The native biology consists of copious sea life, land animals that tend to look like worms or sausages with legs, and a variety of plant-like autotrophes whose chlorophyll photopigment gives them the same color as Earth's plants. Notable are the moaning trees, whose hollow stalks make haunting sounds when the wind blows. Some of the more well-known animals are the wurstcows, large herbivores the size of a small deer to the size of a rhinoceros, and arrowheads, carnivores ranging from weasel-sized to polar bear-sized, depending on species. Arrowheads are aggressive and highly food motivated, and occasionally eat a person. Blisterworms range from a nuisance to a deadly threat. These 10 cm to 2 meter long polypode worms with a brace of tentacles around their head will squirt a viscous, extremely sticky and noxious substance at those who significantly disturb them. The sticky goo not only reeks, it can blister the skin and in some species delivers toxins that are absorbed into the body through the wound. Since colonization, a number of terran life forms have become established, to the detriment of the local ecology. Cats, rats, parrots, feral dogs, mink, ferrets, goats, pigs, carp, pike, bass, trout, goannas, crabs, and rat snakes are considered significant ecological hazards, and have caused many extinctions of the local animals. Even worse are grass and earthworms, which are wholly upending the native ecological systems where they are established. Starlings, pigeons, and squirrels are common in urban areas of Žemyna, but tend to be associated with towns and cities rather than colonizing the local ecosystems. Žemyna was first settled by refugees of the Baltic War, primarily Lithuanians. The site of the first wormhole landing was a series of hills overlooking a broad, fertile plain with a large, winding river in the lower reaches of its path toward the sea. The settlers named their new town Kiaulpienė Stotis, after the floating downy seeds that filled the air at the time of their first arrival. After the initial Lithuanian settlement, other bold explorers and desperate refugees came through. Americans arrived in droves, eager to set down roots on this fertile world. Palauans, seeking a new homeland after their island nation was flooded by rising seas, settled near the coast in the tropical regions and began venturing into the island chains stretching away from the main continent. As English began to replace Lithuanian as the most commonly spoken language, the rapidly growing city of Kiaulpienė Stotis became more commonly known by its approximate translation – Thistledown Station. Although a backwater in galactic terms when it was merely a twig on the end of the American Bough, after The Bump in the Night Žemyna was ideally placed as the main nexus connecting the Human worlds of the Verge. This central location made it the natural choice for the capital of the Verge Republic, and a major port for handling trade between the branches of the wormhole network of Human space. Žemyna quickly grew wealthy, attracting businesses and industry eager to capitalize on its central location, and the talent in terms of personelle that came with them. Žemyna hosts the seat of government for the Verge Republic in Waldemar City. However, it has its own local government for dealing with planetary affairs with a capital in the city of Alytus. Like most worlds of the Verge Republic, it has an executive branch headed by a governor, a bicameral legislature (with a House of Representatives and a World Senate), and a judicial branch with the Žemyna Supreme Court at its head. The governor is elected every six years, senators every four years, representatives every two years, and Supreme Court Justices every four years. Elections for world government offices are by popular vote. Žemynites, or more informally "Zebs". The people of Žemyna see their planet as being the place where things happen in the Verge. It hosts the seat of government of the whole republic, and is at a major crossroads of wormhole routes, making it a center of trade and seeing an unparalleled flow of ideas and cultures through its major metropolitan areas. 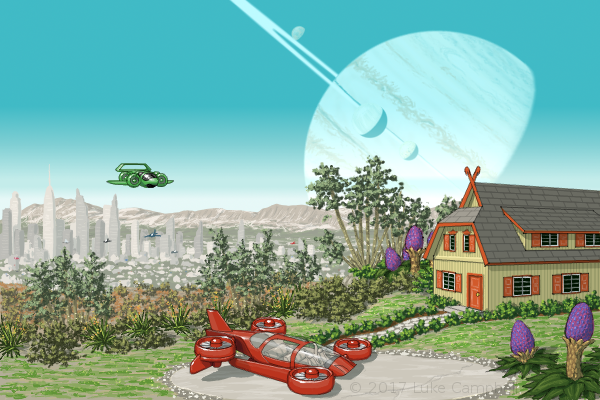 In Thistledown Station, the city that has all the wormholes to other worlds, this attitude is only amplified, and often you get the impression that Thistledown residents think that their city is the only place that really matters. It is undeniably the largest metropolis in the Verge, a thriving center of vibrant culture and commerce. The big cities see themselves as centers not only of commerce, but of culture. Thistledown Station and Waldemar City in particular have many large museums, as well as a symphony orchestra in both cities with a large concert hall, performing arts centers for plays, and many displays of public art ranging from murals to monumental sculptures. There is a strong literary and artistic movement, with bohemian artists, authors, and poets continually producing new work (of highly variable quality). There is a friendly rivalry between Thistledown Station and Waldemar City to see who can be the most beautiful and cultured place in the Verge. The urban Žemynites all too often give the impression that anyone not from a city on Žemyna is an uncultured rube or hick. People from other worlds, or the more rural parts of Žemyna, see these people as out-of-touch liberal urbanites and insufferably smug. Not all of Žemyna is made of big cities. Small towns, smaller cities, and rural agricultural areas make up much of the populated back-land. In contrast to their big-city neighbors, these are typically down-to-earth folk – friendly, helpful, hard-working, and somewhat conservative. They often feel overshadowed by the cities, and feel their concerns are not taken into consideration by the planetary government. Palauan Culture: The tropical regions of Žemyna are often overlooked or forgotten when people think of Žemyna. Here, society is dominated by descendants of Palauan climate refugees. Palauan society is matrilineal, meaning that titles, inheritance, and family affiliation follows female descent. Traditionally, there were different roles for men and women, with men in charge of fishing and women farming and gathering shellfish, although in modern life both men and women will work in a paid job for a living. Because wealth passes through the female line, women have a powerful say in decisions concerning property and wealth. Men and women have different and complimentary roles in traditional governance, with men holding the positions of the village governing council and matriarchs choosing (and dismissing) the men on the council. Elders are given great respect. The Palauans who settled Žemyna were primarily Christian, but with many followers of their traditional syncretic religion, Modekngei, as well, and this division has carried on into the present day. Most still recognize their traditional gods, and Palauan clans have their own clan totems. It is bad form to touch a person's head, since the head is considered sacred. Funerals are major occasions for the gathering of clans and lineages, where accounts of the deceased are settled, and the deceased is buried in a stone platform of his house. Despite being the most populous world of the Verge (with the exception of Jefferson), only a fraction of Žemyna has been settled. The majority of the land is still trackless wilderness. A few hardy pioneers make their living in the back-woods areas. These tend to be rugged and independent folk, many of whom not only tolerate but thrive on loneliness and isolation. The government of Žemyna is making a concerted effort to protect and preserve much of the more spectacular and ecologically important areas as parks and reserves. The people of Žemyna take pride in their local culture. They celebrate the unique contribution of their Lithuanian heritage with festivals and holidays. While the temperate regions of Žemyna are inhabited by people with a strong western European tradition and significant Asian influence, the tropics feature a strong Micronesian and Melanesian culture from their Palauan heritage. The Žemynite people also recognize that Žemyna is more than just Lithuanian and Palauan, made up of an influx of many different cultures from Earth and across the Local Group of galaxies. Even in rural areas, people are pretty tolerant of other ways of doing things as long as it doesn't interfere with their own life-style. The core of Thistledown Station displays high-rise skyscrapers with many elevated covered skywalks between them. Elsewhere, buildings in the style of Gothic, Renaissance, and Baroque styles are common. Many houses display žirgeliai, crossed roof-beams projecting above the roof carved with depictions of horses, representing the pagan god-twins Ašvieniai. Supposedly, this protects the house and its inhabitants from misfortune. Even people who are not superstitious will often use žirgeliai as part of local pride in their culture. In the Palauan-influenced areas, a traditional house is long, wooden, with a sharply peaked roof that strongly overhangs the entrance like a prow and often decorated with traditional motifs. As a meeting place of peoples from across the Verge, the food choices in the cities of Žemyna offer a wide selection. From upscale restaurants to outdoor food stalls in open-air markets, a hungry diner can find food on offering not only from across Earth's cultures but from across the Milky Way galaxy and the Local Group. Žemynite cuisine is best known for its local Lithuanian food style, however, featuring pork, sausages, potatoes, rye bread, barley, beets, dumplings, cabbage soup, berries, and mushrooms. Žemyna has a local brewery tradition and is well known for its craft beers and vodka. The Palauan regions eat more tropical foods – while still featuring pork, their dishes are also composed of cassava, taro, yam, and seafood. Native animals and autotrophes are generally edible (except when protected by poisons), but none have yet been domesticated so they are not common in local dishes except as seafood caught by the local fisheries. Located in Thistledown Station (obviously), Main Thistledown Station is the primary off-world wormhole terminus for Žemyna, as well as leading to branch routes with wormholes to other major cities of the planet. As the major crossroads of all Verge traffic, Main Thistledown Station is constantly bustling with activity. Wormhole trains are constantly departing and arriving, swarms of travellers throng past, and enterprising vendors sell their wares to the eternal stream of visitors. The sections of the station used for bulk freight see an endless progression of standardized intermodal cargo containers being loaded on and off trains to be shipped to various worlds. All this activity led to the creation of major commercial centers and shopping malls within the station. Performance artists are common in the open squares, and much of the publicly accessible areas are decorated with sculpture, artwork, and open-air galleries. The Capital of the Verge Republic, located in Waldemar City, is characterized by its broad boulevards, grassy parks, fountains, and monuments to the Republic's heroes and founders. The buildings exhibit a neo-classical architectural style, with tall columns, symmetrical shapes, domed roofs, and triangular pediments. The National Museum is housed in several expansive buildings along the parkway between other federal government buildings.